This Referral Program is valid until 31 December 2016. The referral and referee should NOT be the same person. 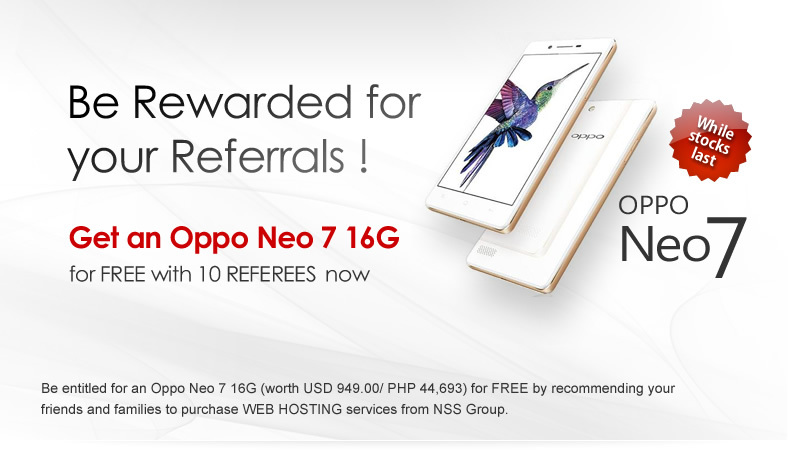 Employees of NSS Group are not eligible to participate in this Referral Program. The referral must be NSS Group existing clients while the referees must be new clients who are not registered as NSS Group clients in the past 6 months. This Referral Program is not applicable with other concurrent promotions. Each transaction for the web hosting services should be worth USD 100 / PHP 4695 and above to be eligible on this referral program. For the prize redemption, NSS Group will notify the referrals after 90 days from the time we have received the referees and we have received full payment from the referees. Failure to redeem prize within 30 days after notification will result to forfeiture of the prize. Each participant is entitled to redeem ONE prize only (based on the ID no, name and address). Any repeated entries or fraudulent use other name for registration shall NOT be accepted. The participant will be responsible for the legal ramifications of that action. Prize will be delivered based on the mailing address provided. NSS Group will not be held responsible or liable for incorrect information provided and/or any problem resulted failed delivery thereto or arising therefrom. NO repeat delivery will be made. Prizes are not transferable, and not exchangeable for cash. If the prize(s) is/are out of stock or any problem of whatsoever nature and in whatever manner, NSS Group reserves the right to substitute the prize(s) with other products of similar retail value. NSS Group will not be held responsible or liable for the prize's warranty or its maintenance. NSS Group reserves the right to verify the identity of the referral(s) and referee(s). If the information provided is invalid or involved in any fraudulent activity, NSS Group reserves the right to disqualify the participation of the referral (s) at its sole and absolute discretion.